Burgess Hill were frustrated first by Goring’s batsmen and then by the weather. Goring opted to bat and opening bowlers Dan Strange and George Willett were uncharacteristically wayward in their opening overs. Once Strange found his length the reward came with both Sam Thorns and Anir Guha falling LBW. Goring captain Danny Pittham was batting positively and seized on anything loose and found good support from Jonathan Coutts (27) and Ben Cartwright. George Willett recovered his rhythm and had Coutts caught by Nathan Cooper. However it was the introduction of Zain Patel (4-53) which allowed inroads to be made. Pittham was cutting loose and Marques Clarke (26) was in belligerent mood. However, Patel, supported by Jack Simpson (2-59) and some safe catching steadily worked through the Goring batting order. Pittham fell to Patel for 71 and George Willett (2-22) accounted for last man Aaron Wyatt and Goring were all out for 198. Burgess Hill’s reply was positive but rain delays reduced the overs remaining. At 35-0 in the ninth over Hill were up for the challenge but the next deluge ended proceedings and the game was abandoned as a draw. Hill remain top of the division alongside Haywards Heath. Burgess Hill Second XI increased their lead at the top to 14 points with a dominant victory over Glynde. Glynde opted to bat first but were in trouble as two quick wickets fell, first Hugh Warmisham bowling David Clark and then a run out by Peter Billinghay accounting for Sidney Branford. Warmisham (2-18) grabbed another but Glynde recovered to 64-3 thanks to 33 from Matthew Cramp. The introduction of Peter Billinghay brought successive wickets and when Dan Maskell (1-16) bowled Louis Barron Glynde were teetering on the edge at 79-6 when rain stopped play. Early tea was taken and a further hour of rain delayed play further but as play resumed only 16 from Daniel Head and couple of big shots from Cameron Cox prevented Hill from bowling out Glynde for less than their 121 all out in 40.4 overs. Billinghay took the final wicket to finish with 5-40. Hill started carefully in reply, Barron bowling with pace and movement and Mike Brooks nagging away with his consistent line and length. Shaun Kevern survived early, a thick edge shelled by wicket keeper Cramp who really should have left the chance well alone as it sailed comfortably towards first slip. The drop was costly as Kevern accumulated 30 runs and shared an opening stand of 38 with Warmisham (17). Cox accounted for Warmisham and there was brief hope when Barron had Steve Cromb caught at point six balls later. 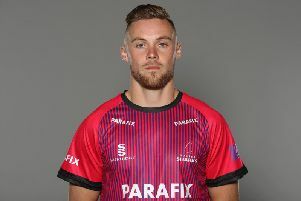 However Aaron Barnes struck 37 not out in 45 balls and despite the loss of Kevern, Barnes and Tom Penfold (16) took Hill to victory by six wickets with nearly 20 overs to spare.